However, traditional bottom-rolling systems come with a raised lower glass track, which means that there is a barrier between the two spaces. This is not the case with top-hung systems. The seamless lower track profile enhances aesthetics, improves functionality, and provides greater flexibility. 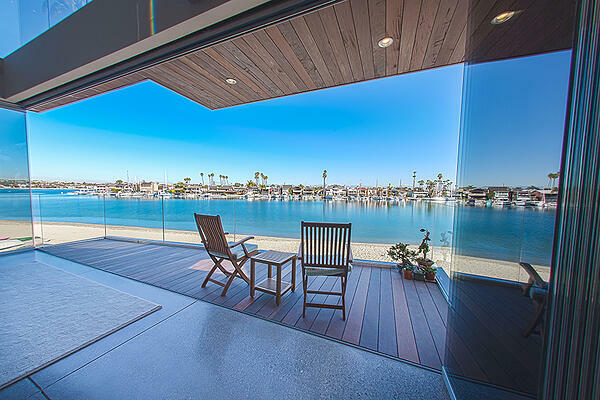 As the design of the sliding glass is unimposing, it takes nothing away from the splendor of the view. For instance, the track measures just 1 ¾ inches wide by 2 ¼ inches high, making it barely noticeable. 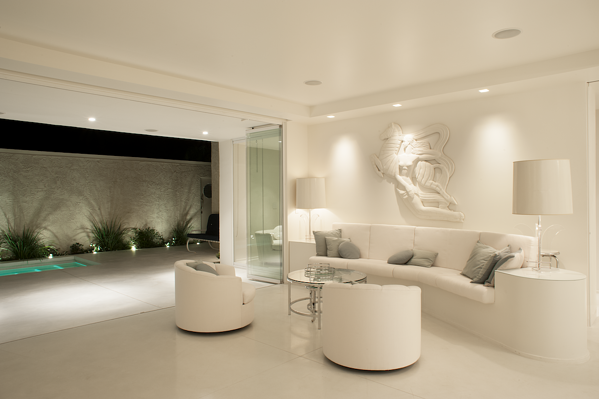 Only with recessed tracks is it possible for the outdoors to become part of your home. As you can see, the lower track matches the finished floor height of both the inside and outside. This creates a seamless transition. 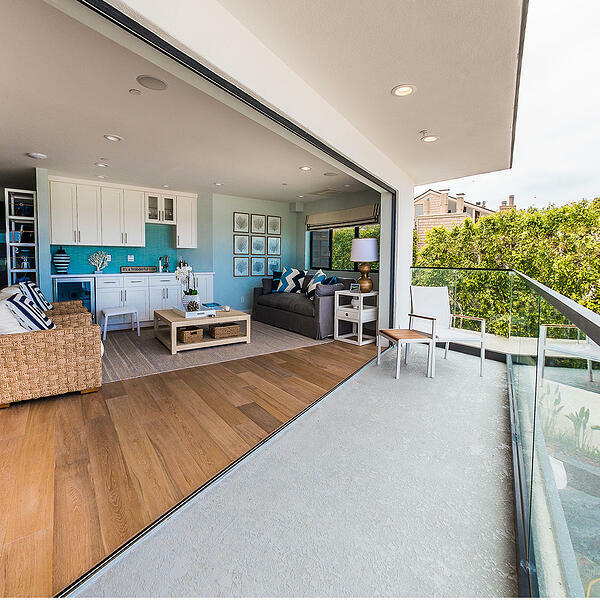 Top-hung sliding doors are weatherproof. 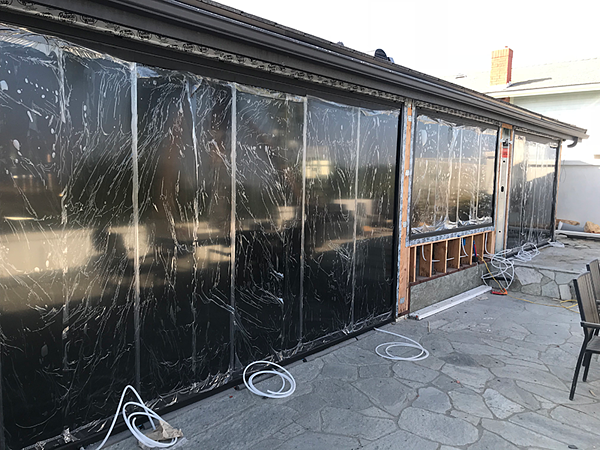 To ensure that water is unable to enter the hole, the installation of the doors includes fitting either weep holes or drainpipes, depending on what is best for the home. The water slides off the outside of the glass and the drainage system removes it. In addition, profiles are coated in powder or finished with kynar and the metal parts are all made of stainless steel to maximize the doors’ capability to withstand the elements. Opening and closing the sliding doors is effortless because of the way the panels glide along the tracks. The panels are suspended between the upper and lower tracks and held in place with stainless steel fasteners. This creates a secure fit and optimizes usability. With nothing to step over, you can move easily between spaces. In addition, the lack of a tripping hazard makes the sliding glass doors suitable for a wide range of locations. For instance, this home used its doors to create a flexible space — the homeowners can open the doors for to make a floor plan that encompasses the terrace or close them to form a cozy room — without losing any natural light. All the above benefits only come with a sliding door system that features a seamless lower track profile. It may seem like a small thing, but flush lower tracks make a huge difference to style, applicability, and comfort.